Although scientists have been able to levitate specific types of material, a pair of UChicago undergraduate physics students helped take the science to a new level. Third-year Frankie Fung and fourth-year Mykhaylo Usatyuk led a team of UChicago researchers who demonstrated how to levitate a variety of objects—ceramic and polyethylene spheres, glass bubbles, ice particles, lint strands and thistle seeds—between a warm plate and a cold plate in a vacuum chamber. 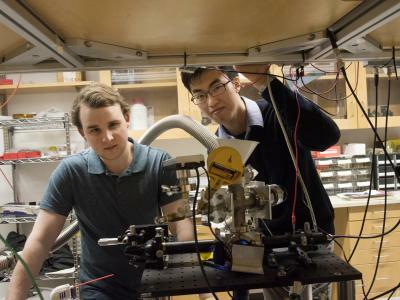 “They made lots of intriguing observations that blew my mind,” said Cheng Chin, professor of physics, whose ultracold lab in the Gordon Center for Integrative Science was home to the experiments. In their work, researchers achieved a number of levitation breakthroughs, in terms of duration, orientation and method: The levitation lasted for more than an hour, as opposed to a few minutes; stability was achieved radially and vertically, as opposed to just vertically; and it used a temperature gradient rather than light or a magnetic field. Their findings appeared Jan. 20 in Applied Physics Letters. 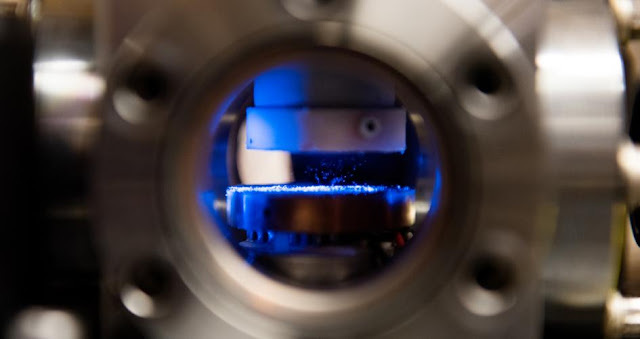 “Magnetic levitation only works on magnetic particles, and optical levitation only works on objects that can be polarized by light, but with our first-of-its-kind method, we demonstrate a method to levitate generic objects,” said Chin. In the experiment, the bottom copper plate was kept at room temperature while a stainless steel cylinder filled with liquid nitrogen kept at negative 300 degrees Fahrenheit served as the top plate. The upward flow of heat from the warm to the cold plate kept the particles suspended indefinitely. UChicago researchers achieved levitation of macroscopic objects between warm and cold plates in a vacuum chamber. The key to obtaining high levitation stability is the geometrical design of the two plates. A proper ratio of their sizes and vertical spacing allows the warm air to flow around and efficiently capture the levitated objects when they drift away from the center. Another sensitivity factor is that the thermal gradient needs to be pointing upward—even a misalignment of one degree will greatly reduce the levitation stability. The apparatus offers a new ground-based platform to investigate the dynamics of astrophysical, chemical and biological systems in a microgravity environment, according to the researchers. Fourth-year Mykhaylo Usatyuk (left) and third-year Frankie Fung. Levitation of macroscopic particles in a vacuum is of particular interest due to its wide applications in space, atmospheric and astro-chemical research. And thermophoresis has been utilized in aerosol thermal precipitators, nuclear reactor safety and the manufacturing of optical fibers through vacuum deposition processes, which apply progressive layers of atoms or molecules during fabrication. The new method is significant because it offers a new approach to manipulating small objects without contacting or contaminating them, said Thomas Witten, the Homer J. Livingston Professor Emeritus of Physics. “It offers new avenues for mass assembly of tiny parts for micro-electro-mechanical systems, for example, and to measure small forces within such systems. Levitation of materials in ground-based experiments provides an ideal platform for the study of particle dynamics and interactions in a pristine isolated environment, the paper concluded. Chin’s lab is now looking at how to levitate macroscopic substances greater than a centimeter in size, as well as how these objects interact or aggregate in a weightless environment. “There are ample research opportunities to which our talented undergraduate students can contribute,” Chin said. Funding: National Science Foundation, Grainger Foundation and Enrico Fermi Institute.